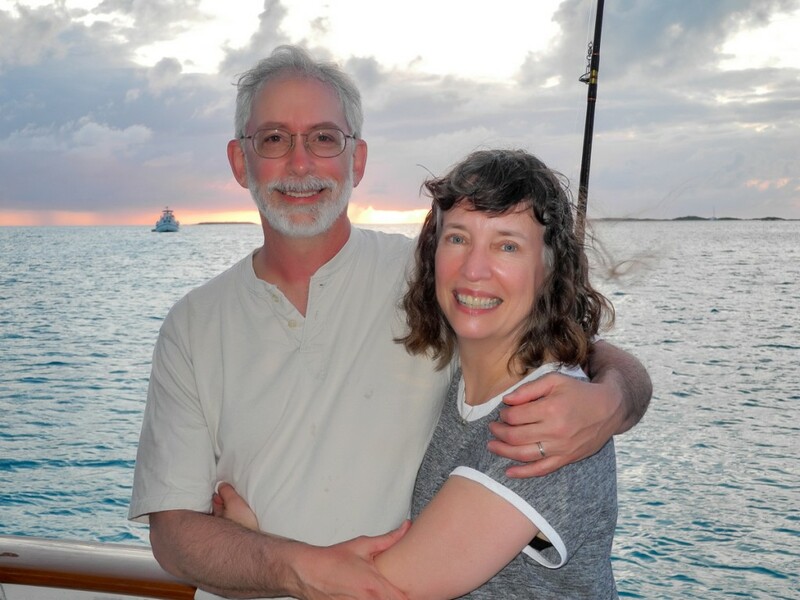 We left Nassau at the end of March and headed to the Exumas where we spent a month exploring the many Cays that comprise this beautiful 130 mile long island chain. 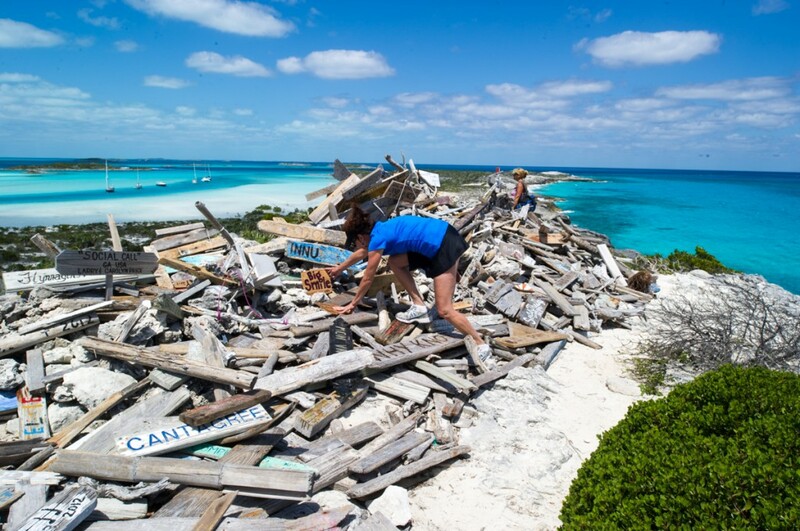 There are over 360 islands within the chain, the largest being Great Exuma. Our first stop after leaving Nassau would be Shroud Cay. We picked Shroud based on discussions with other boaters. It proved to be an easy 7 hour crossing of the “Yellow Bank” and we dropped anchor at 3:45 PM. The kayaking proved to be as good as we had been told. 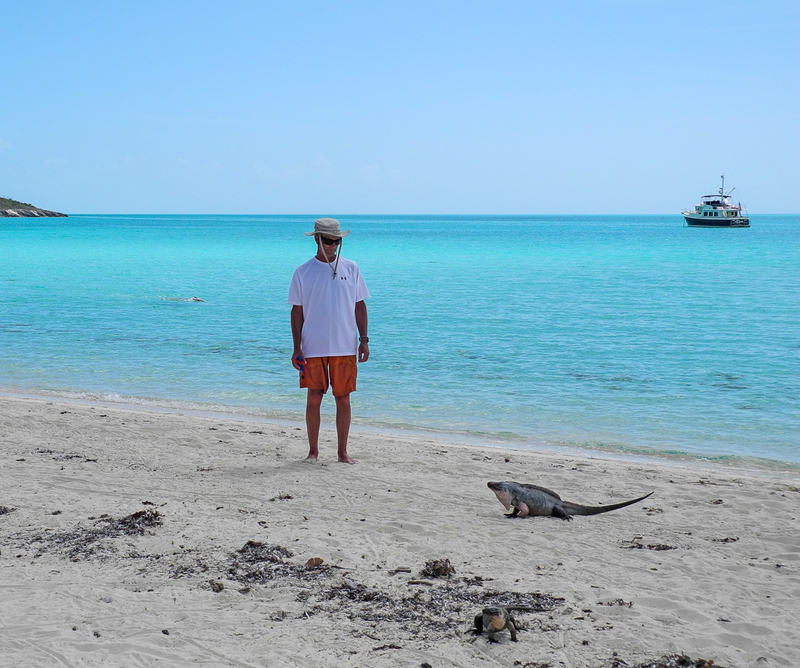 It was at Warderick Wells Cay that we really began to understand the beauty of the Exumas. 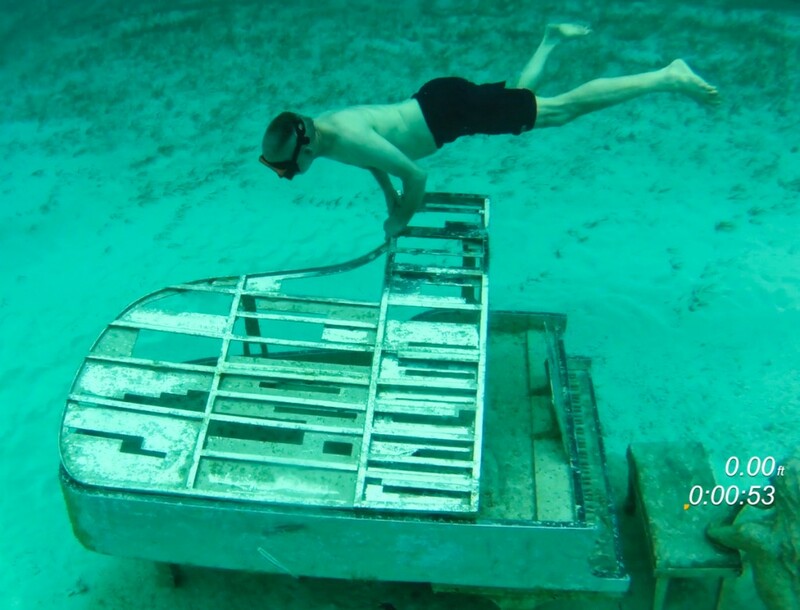 Warderick Wells is home to the headquarters of the Exuma Cays Land and Sea Park. This park was first suggested by an American in 1953 and the idea was adopted by the government and established in 1958. 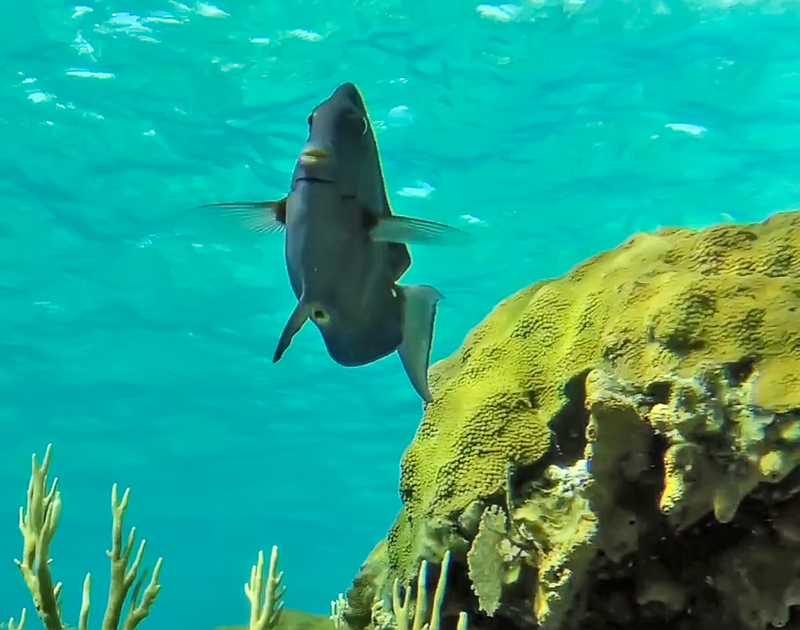 Approximately 22 miles was set aside and is overseen by the Bahamas National Trust. 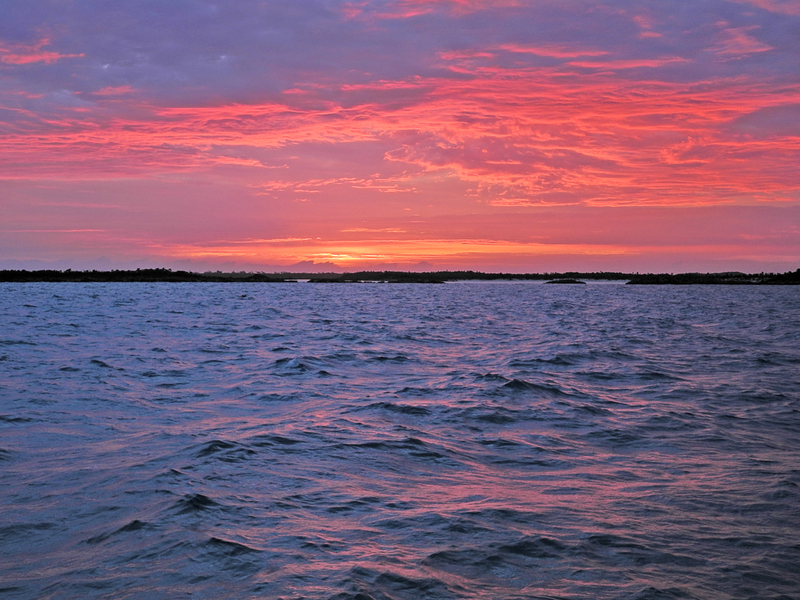 It is an exquisite area of the Bahamas with many Cays to explore by boat, kayak and on foot. The park maintains some moorings and twice we picked one up at Cambridge Cay. Warderick is the epicenter of the park. It is also home to BooBoo Hill. 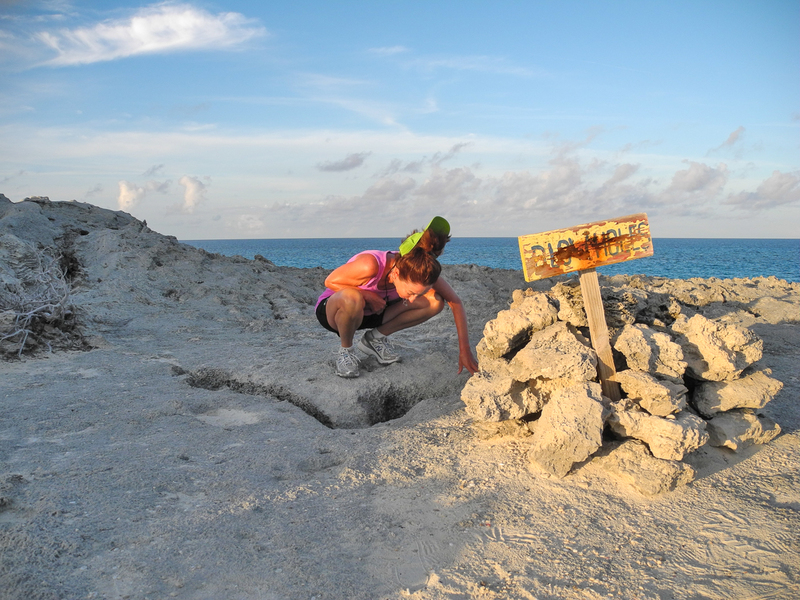 BooBoo Hill is an easy climb to the highest “peak” in the Exuma Chain. Legend says that the cry of ghosts can be heard at night. 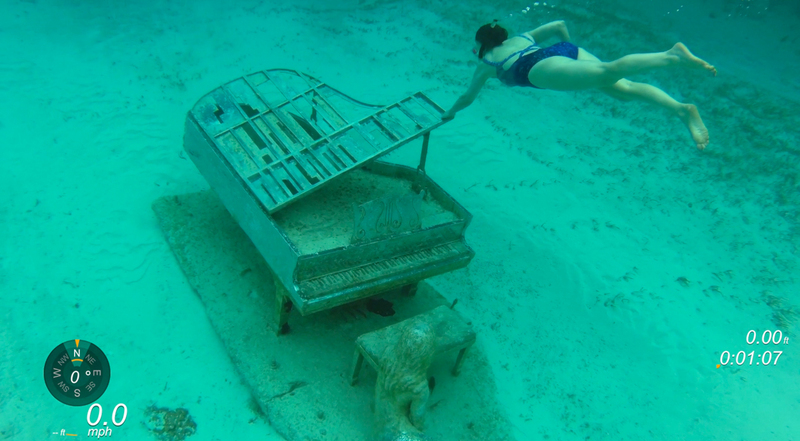 To appease the sea gods tradition is to leave an offering to King Neptune. This offering, usually in driftwood with the name of the vessel, will bring fair winds and weather. Well, as we knew nothing of this tradition we were desperate to find something to offer. In our galley was an unused cutting board and Cath went to work creating what we hoped would be an acceptable and good looking offering. The next day we marched back up the hill and placed ours upon the pile. It must have worked for it is now a month later and we have had beautiful weather. 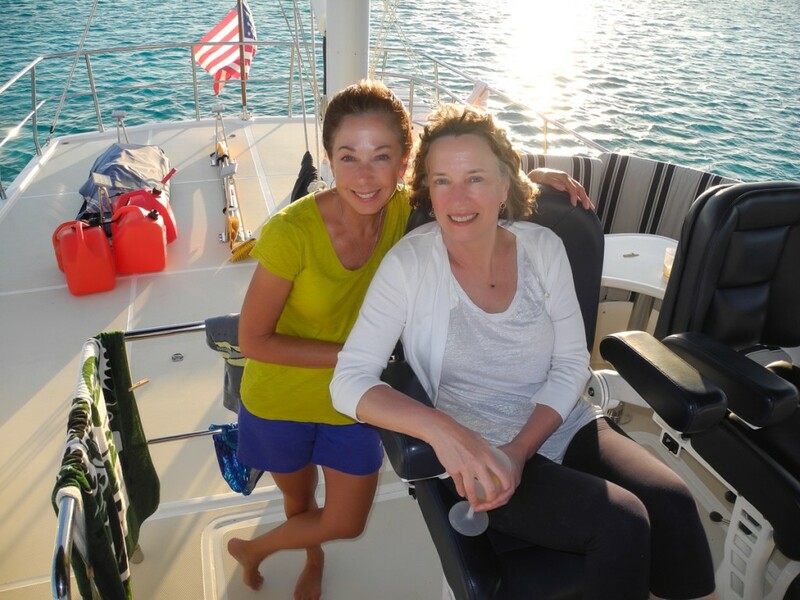 Cath and I had the pleasure to actually do some back tracking thru the Exumas and this post will cover both voyages. 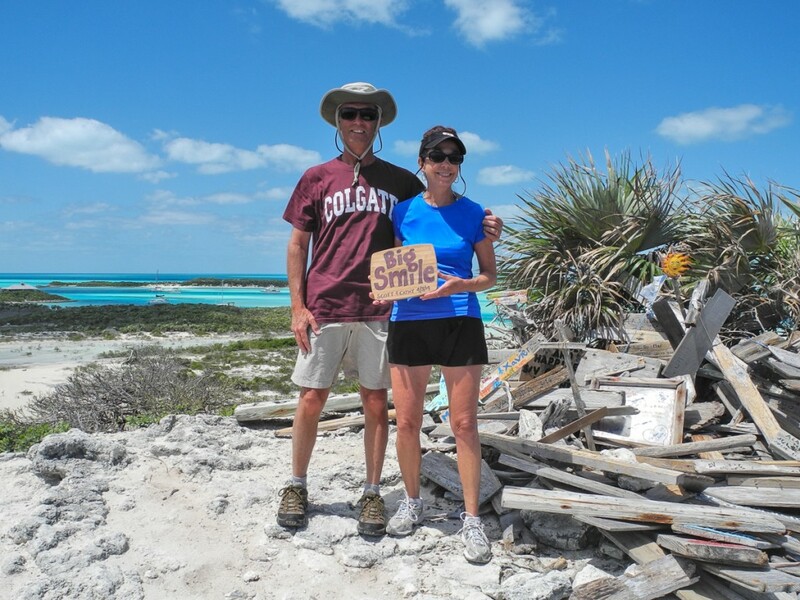 Halfway thru the month of April we had made it down to Georgtown, Great Exuma as we were scheduled to pick up Cath’s brother and his wife. 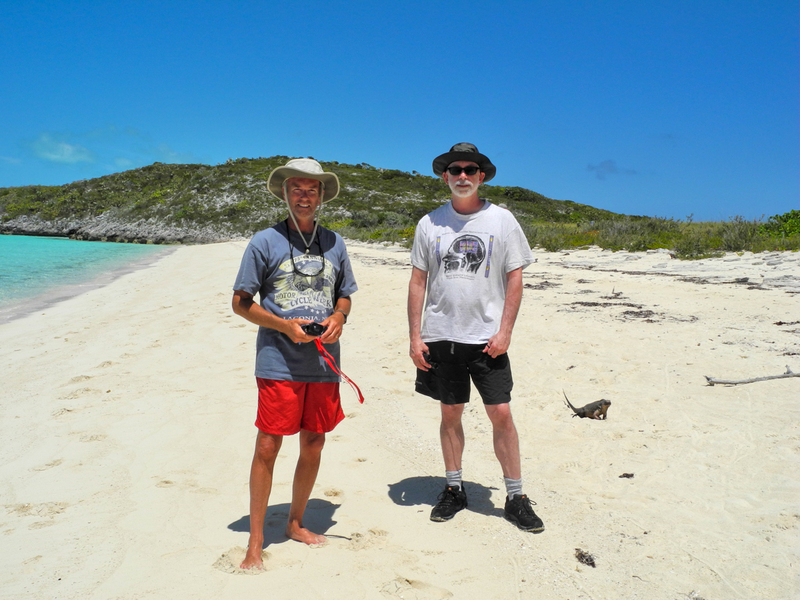 Prior to meeting them at the airport we rented a car and explored a bit of Exuma. We had not been there since 1988 and one goal was to find the house we stayed in. We knew it was north of Georgetown and we remembered what it looked like but we never were able to find it. 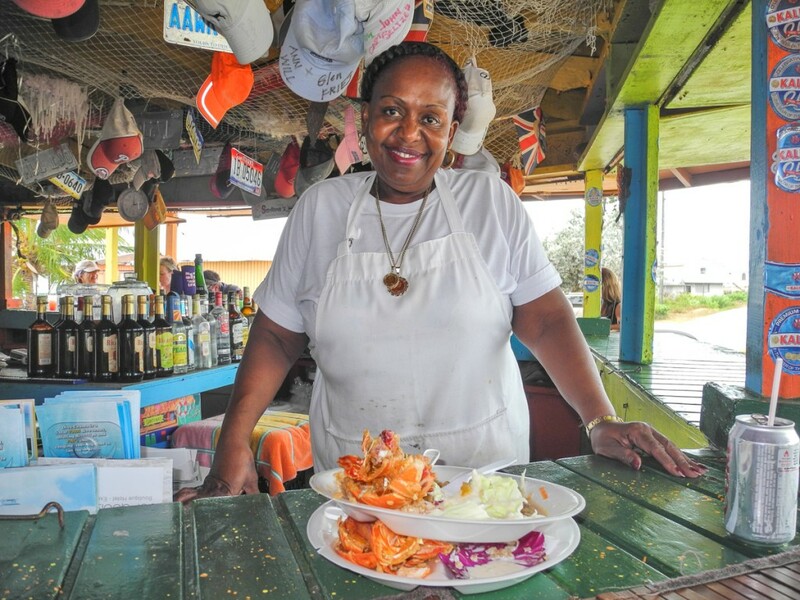 We did find, south of Georgetown, on Little Exuma Cay a restaurant called Santanna’s Grill Pit. Trip advisor had it rated # 1 so we checked it out. Well it is a shack on the beach with bench seats around a bar and tables overlooking the beach. It also happens to serve the best lobster we have ever eaten. 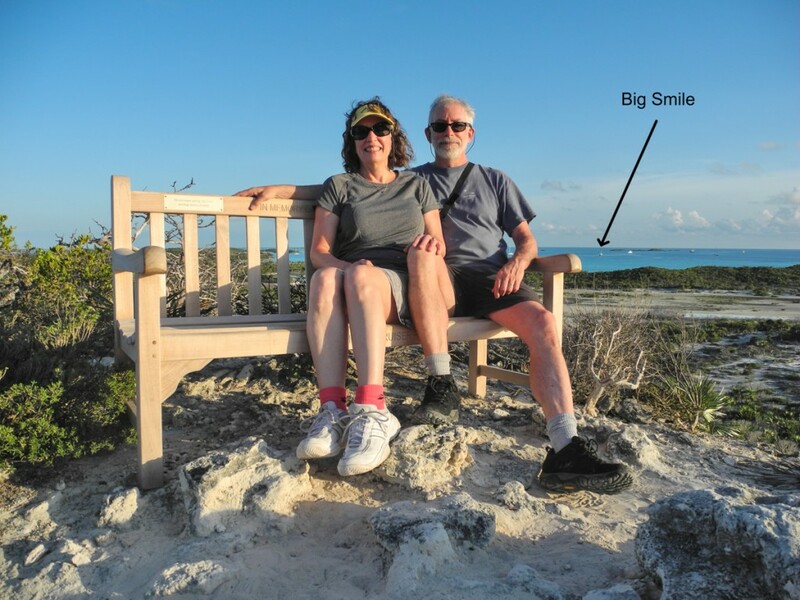 We picked up Barry and Rebecca at the Exuma airport and took off the following day heading back north thru the Exuma chain. 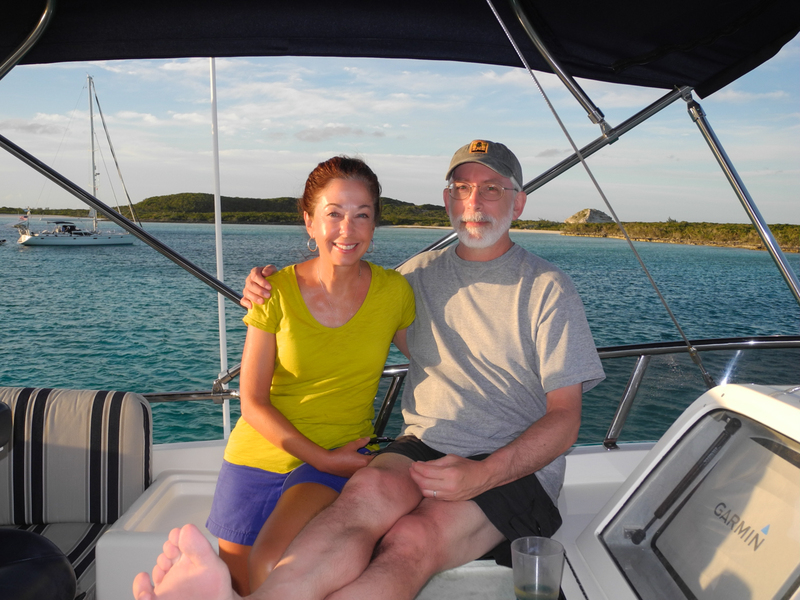 Our first stop was Rudder Cay, 36 miles up from Georgetown. This would be our first snorkeling stop with them and it certainly was a unique one. 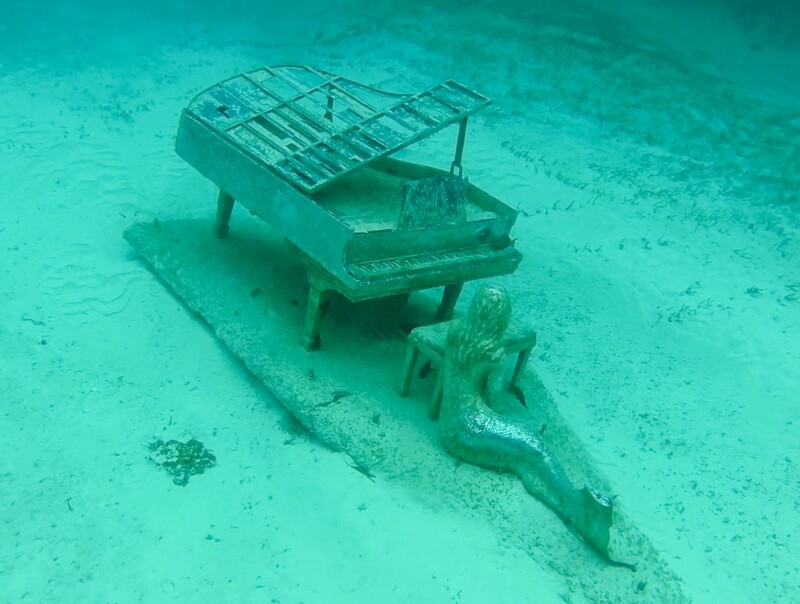 Just south of our anchorage lying in about 15 feet of water is a full size stainless steel sculpture of a mermaid at a piano. 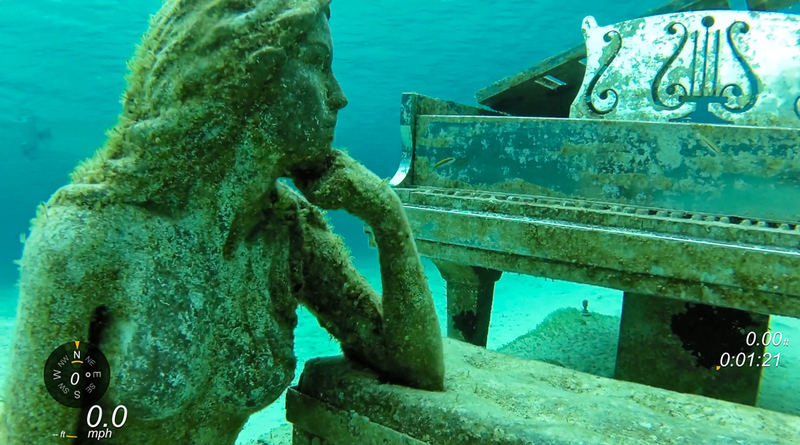 It was commissioned and placed by David Copperfield. Why I don’t know. Continuing north our next stop would be Bitter Guana Cay. This would be one of the several overlapping stops we made southbound and northbound. 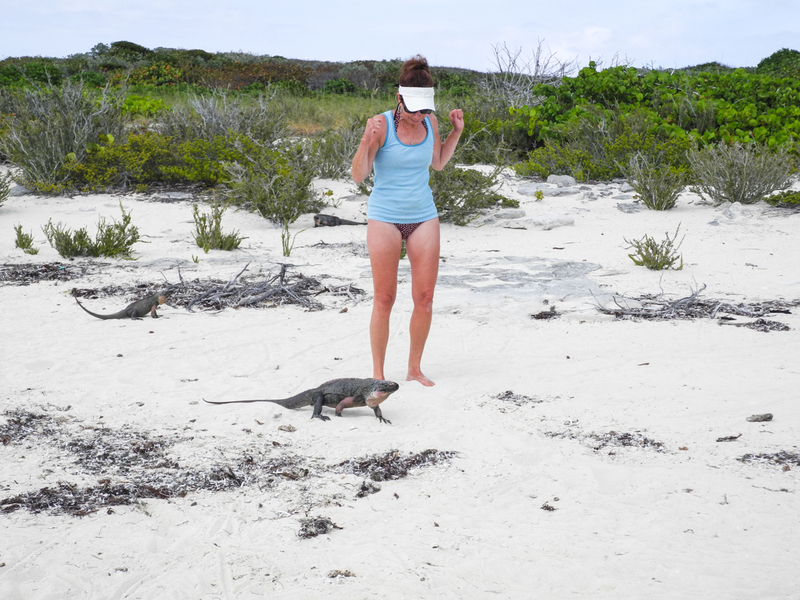 Bitter Guana is home to the Exuma Island Iguana a subspecies of Northern Bahamian Rock Iguana. 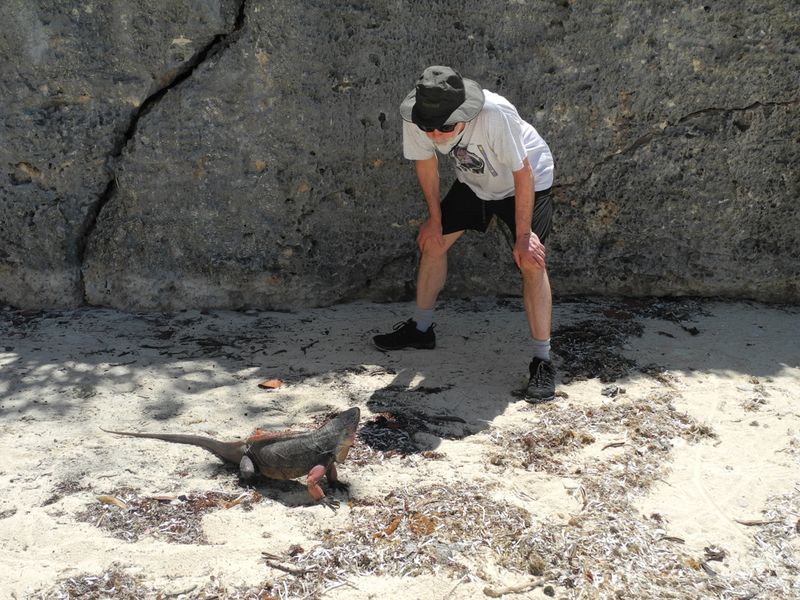 Growing to a length of over 3 feet they are impressive to see scampering around the beach and lying motionless under the vegetation. 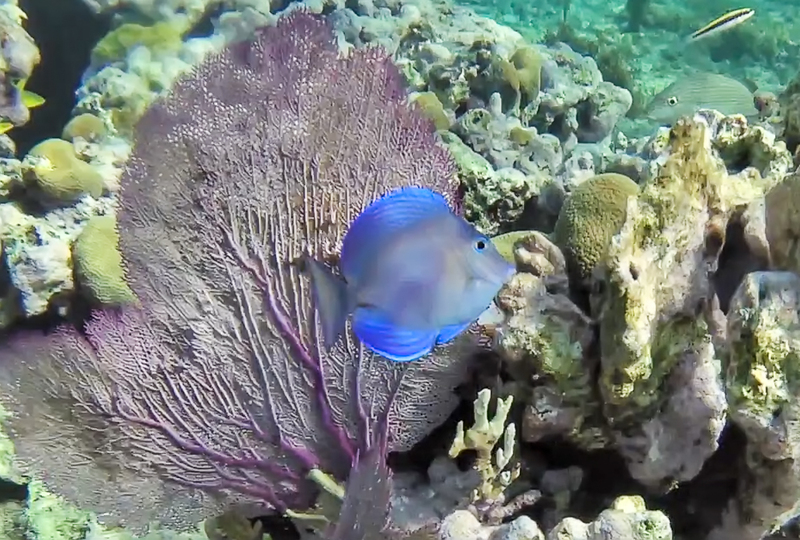 A short cruise north brings you to Big Majors Cay. This is a very popular anchorage for cruisers. 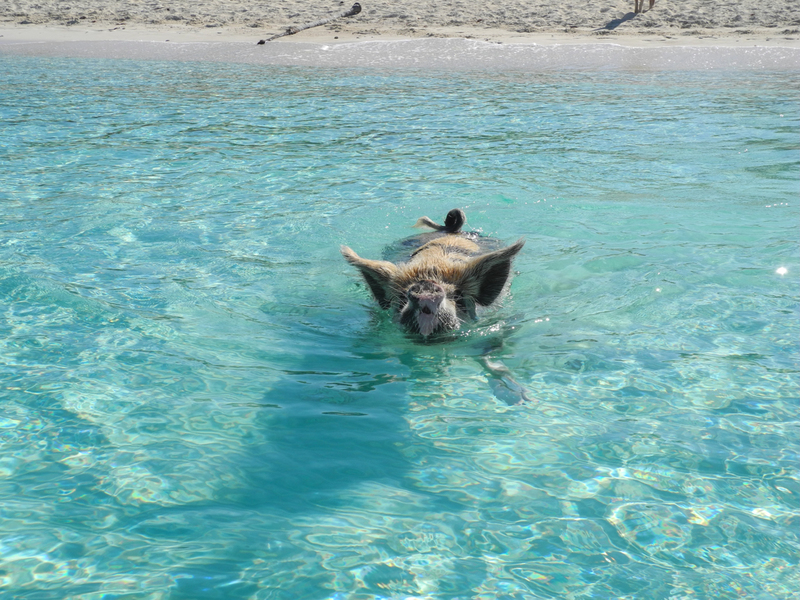 It is close to Staniel Cay and Thunderball Grotto and has its own unique animal attraction, swimming pigs. 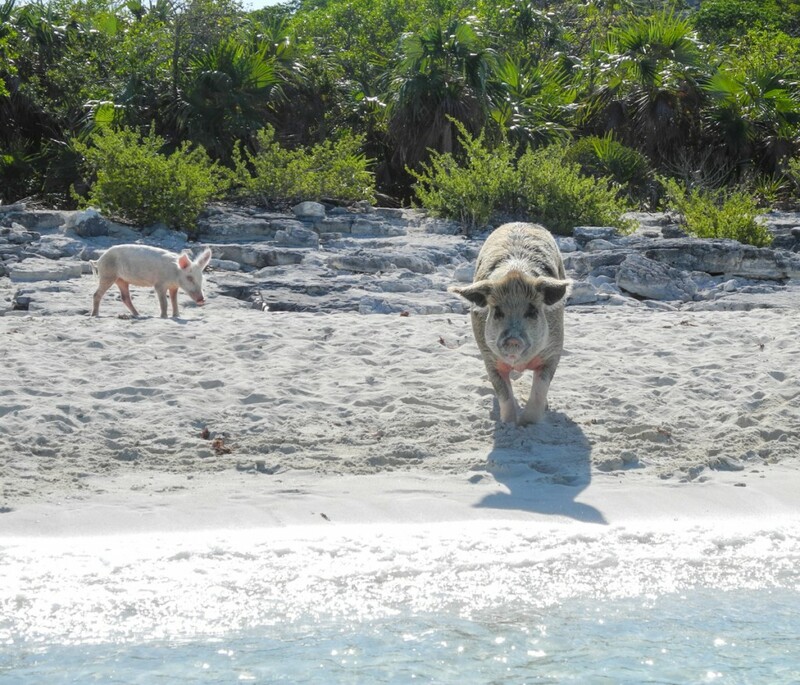 These feral pigs range in size from piglets to bruising beasts. They will climb into your dinghy if you get to close as the big ones can really swim. 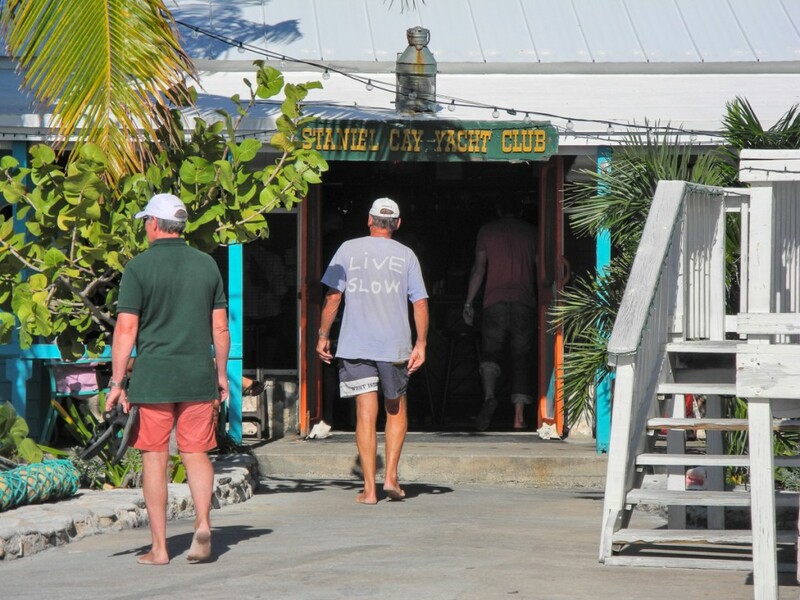 Staniel Cay has one of the quintessential bar/restaurants that all boaters look for. The marina is small but we managed to get a slip reservation for one night. 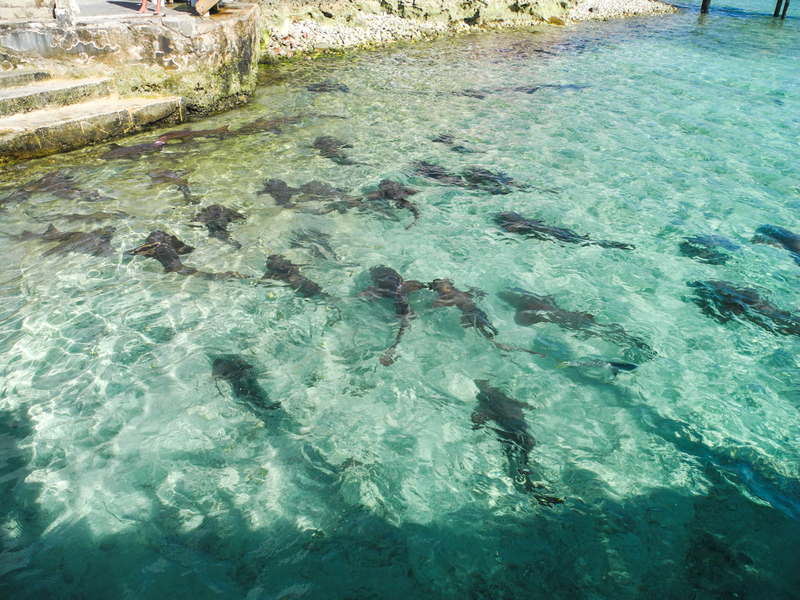 Their marina attracts dozens of nurse sharks who hang about looking for handouts during fish cleaning in the late afternoons. It’s a sight to see. We ate dinner ashore at Staniel Cays quaint restaurant. 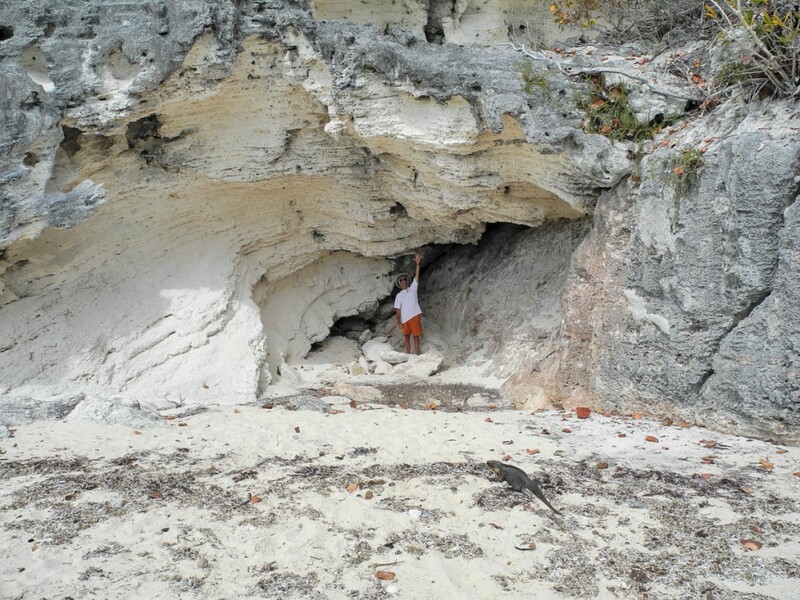 Within sight of Staniel Cay is Thunderball Grotto. Scenes from two James Bond movies were filmed here. 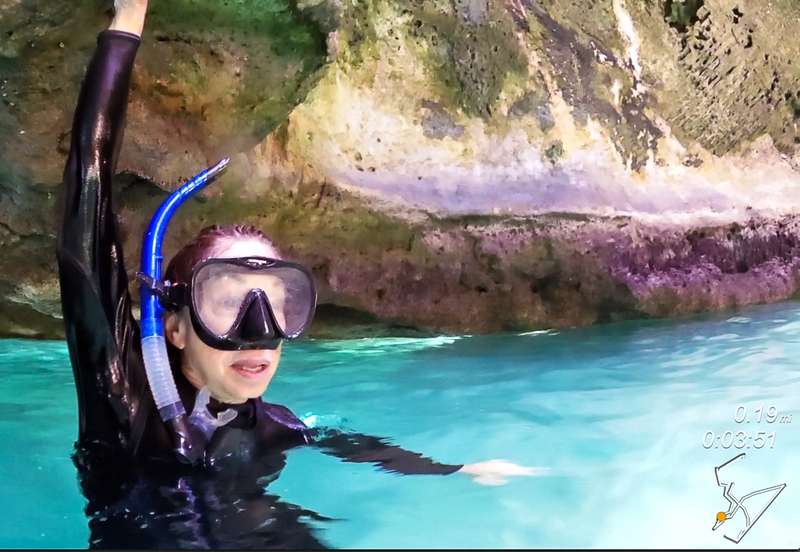 The grotto has several entrances which at high tide require you to swim underwater to enter the cave. 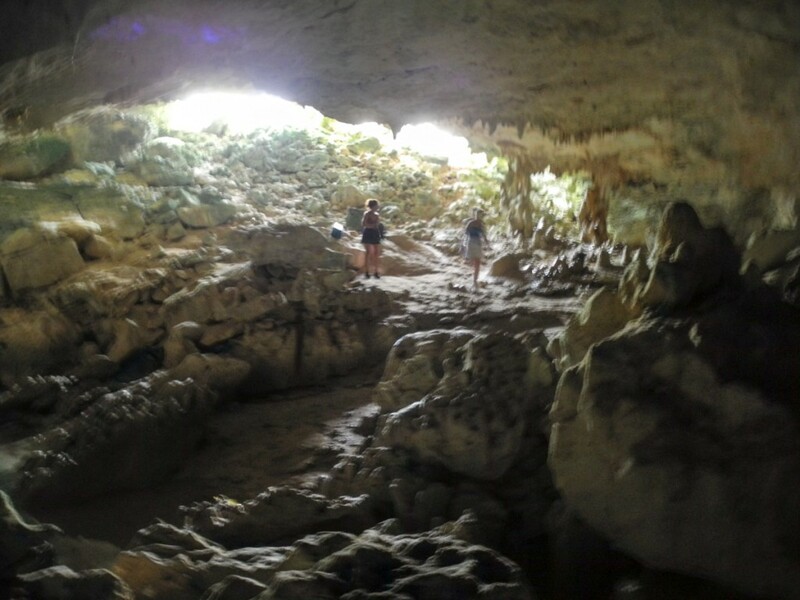 Inside the ceiling is 20 feet high with many natural skylites eroded through from rain. These skylites allow sunlight to penetrate and light up the interior. 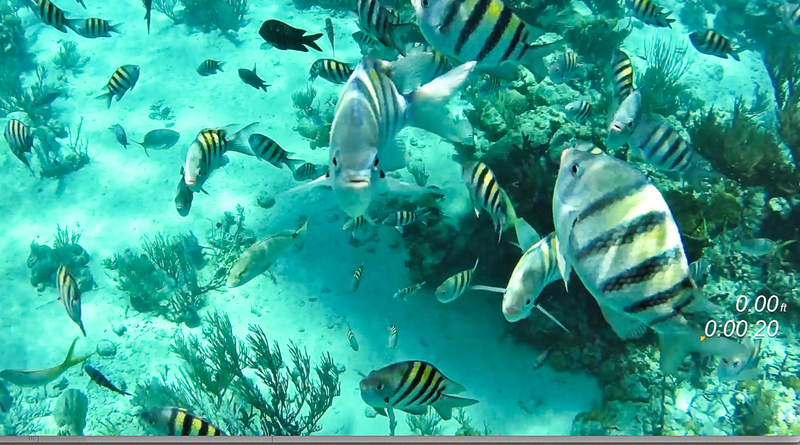 Many species of fish can be found here. 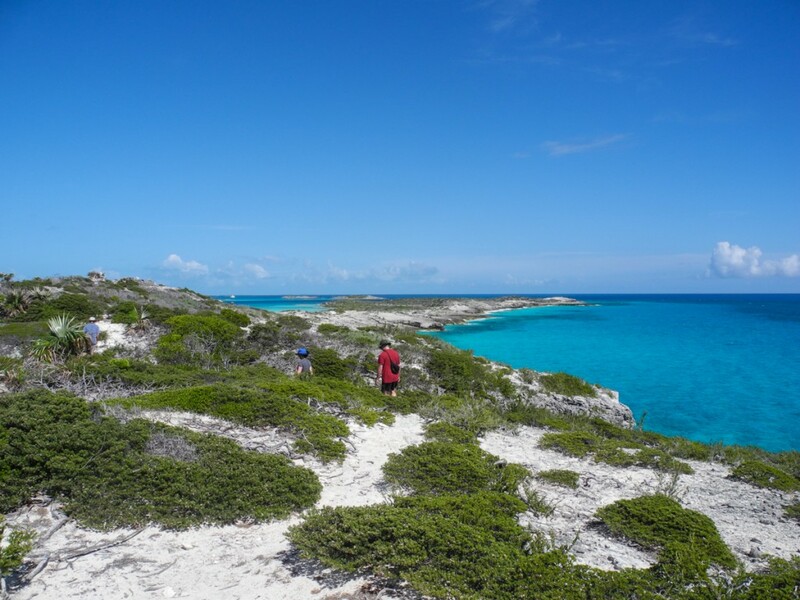 Warderick Wells and Cambridge Cay: These two magnificent spots lie approximately 15 miles north of Staniel Cay. I called to reserve a mooring ball at Warderick but none were available for our size boat and so we dropped the hook off Emerald Rock as we had on the south bound trip and explored from there. Of course we had to take our guests up Boo Boo Hill and show them our sign. 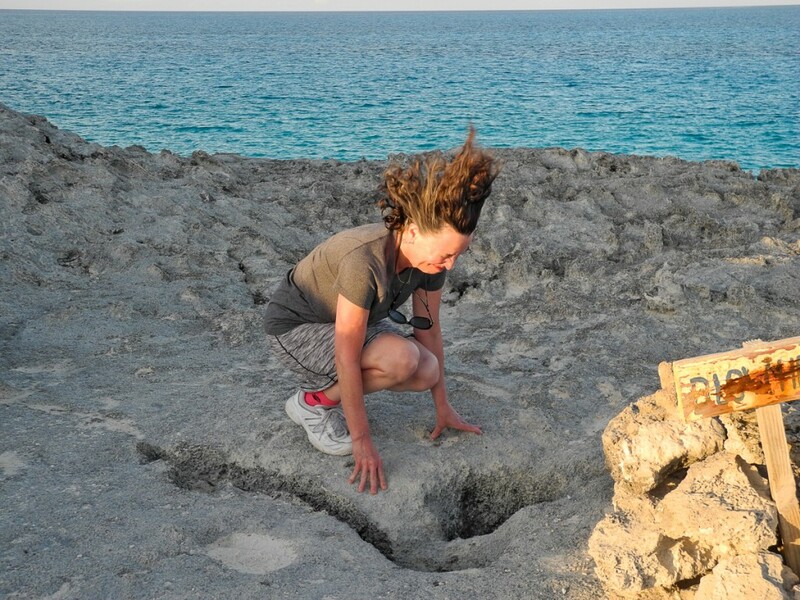 We also found a blow hole which Cath and Rebecca used to do their hair. 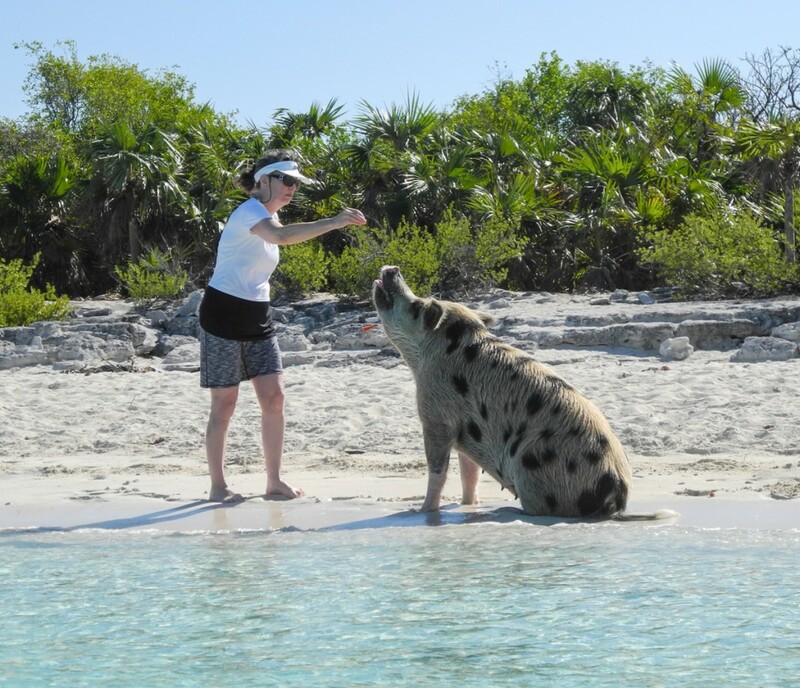 Cambridge Cay, just south of Warderick Wells is near the Exuma Park Sea Aquarium off O’Briens Cay. Cambridge has mooring balls and we grabbed one. 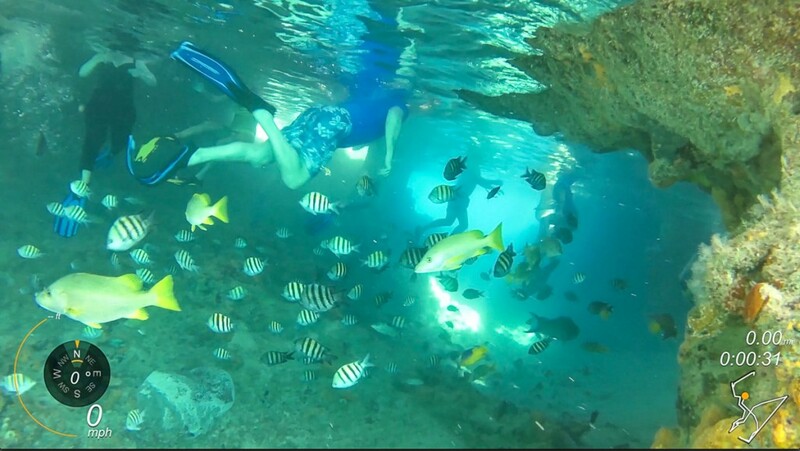 The Sea Aquarium is a snorkel site with an amazing variety of fish. It is an easy dinghy ride from Cambridge and has mooring balls to tie your dinghy to. 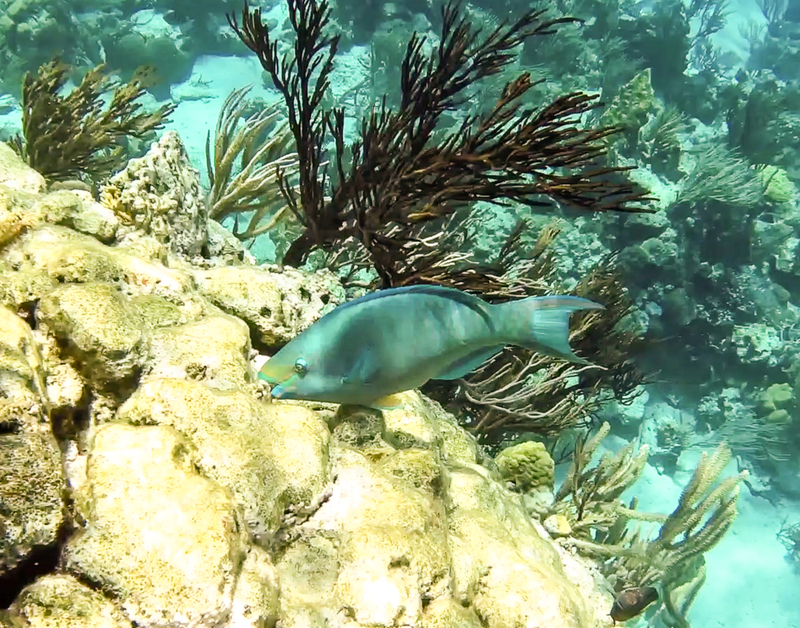 The snorkeling is some of the best you will ever find. 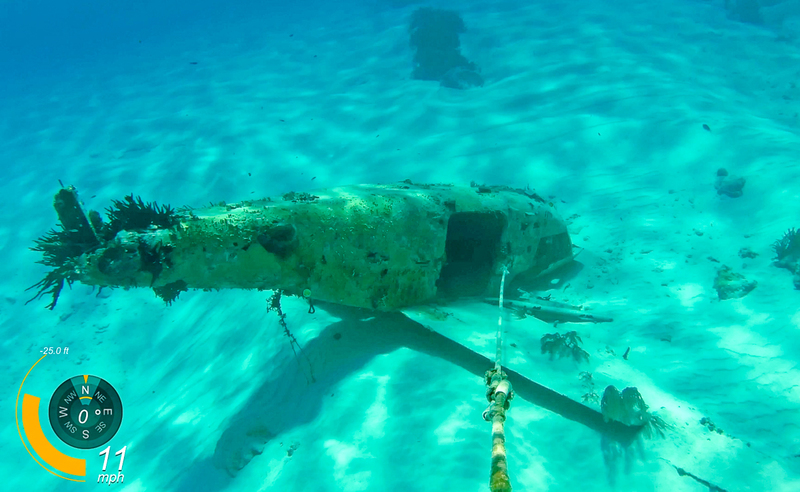 In addition to finding fish underwater we also snorkeled on two plane wrecks. A single engine wreck located near the Sea Aquarium was in about 20 feet of water. The fuselage was intact and you could carefully enter it and exit on the other side. The other was near Staniel Cay and was a twin engine wreck in only about 5 feet of water. 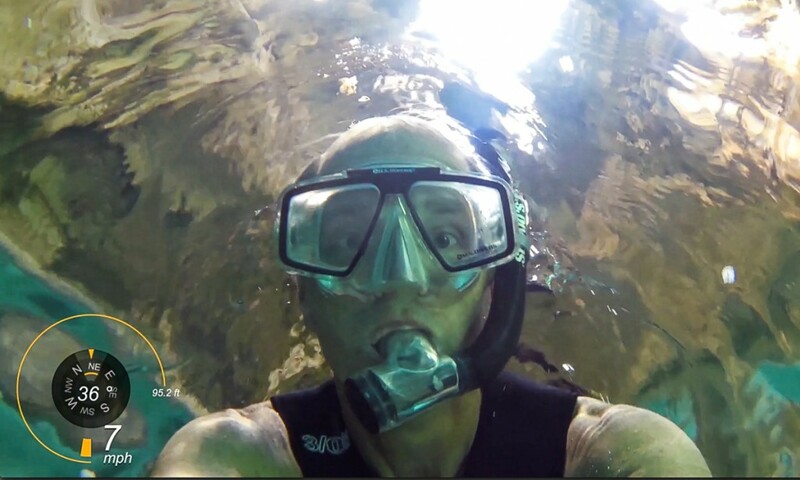 They were both fun to dive and they also attracted a large quantity of fish. While Big Smile is not a fishing battlewagon we do try to catch them on extended cruises. 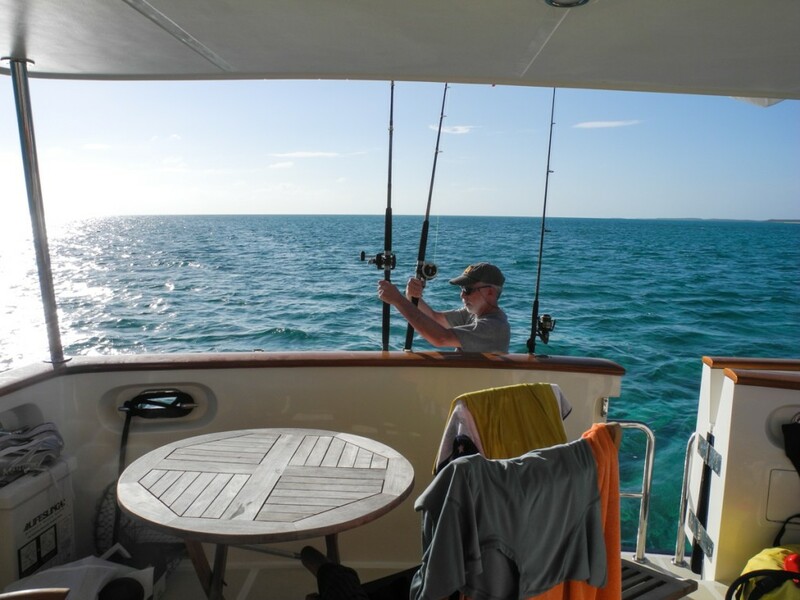 Barry was successful very quickly and landed a nice size Cero. Slightly larger than a Spanish Mackerel it can put up a good fight. Not only did he land it but also cleaned it and what a meal we had that night. Eventually we had to start heading back to Great Exuma and we chose Great Guana Cay as our last anchorage. 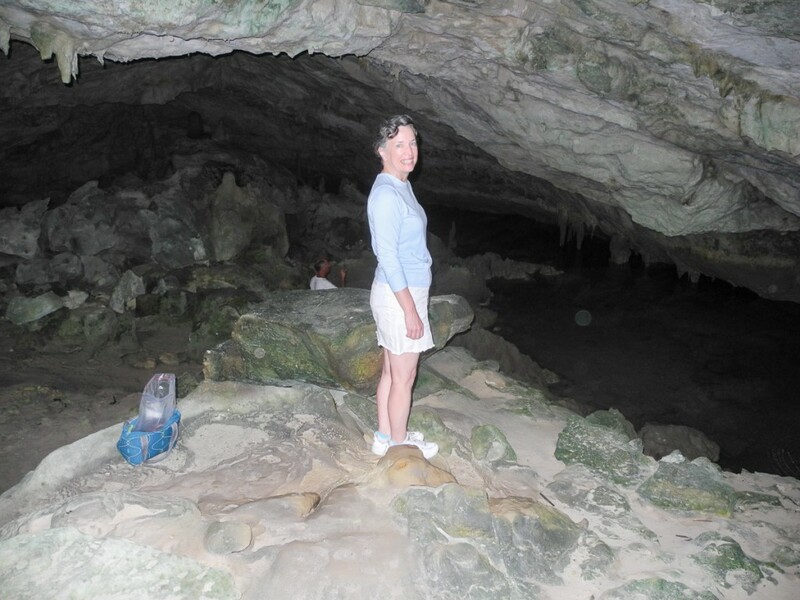 After dropping the hook we immediately went ashore to find the cave we had read about. 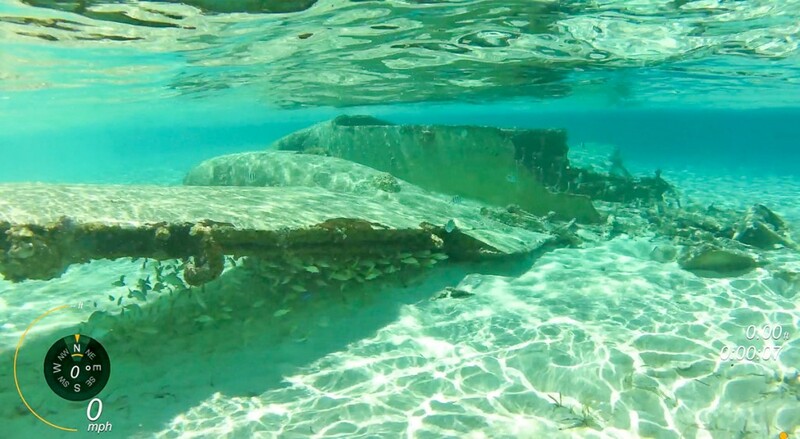 It contains two fresh water pools each over 50 feet deep that you can tank dive. One branches off over 500 feet. 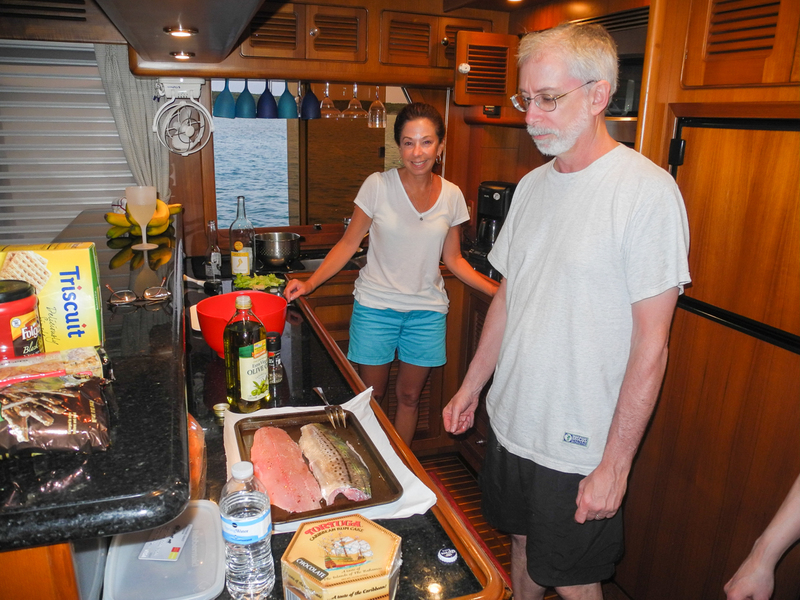 Our final full day with Barry and Rebecca was a five hour ride down Exuma Sound to Emerald Bay Marina. Seas were 3-5 feet with wind on the nose but we all found a spot to relax and enjoy the ride. 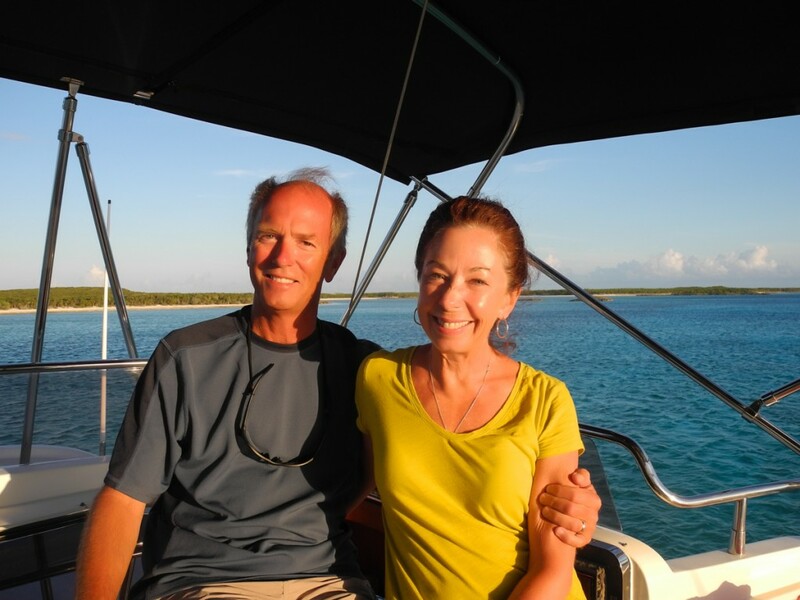 The Exumas were a wonderful adventure for Cath and I and we had a great eight days sharing it with our guests.